Digital transformation it is not simply about technology—it requires leaders to re-envision existing business models and embrace a different way of bringing together people, data, and processes to create value for their customers. That’s a tall order. So, where do you start? 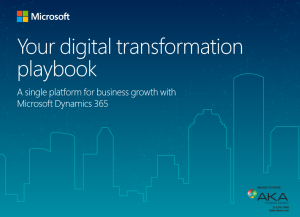 Read this digital transformation playbook and discover 5 ways Microsoft Dynamics 365 enables organizations to grow, evolve, and meet the changing needs of customers.